KOKOMO, Ind. 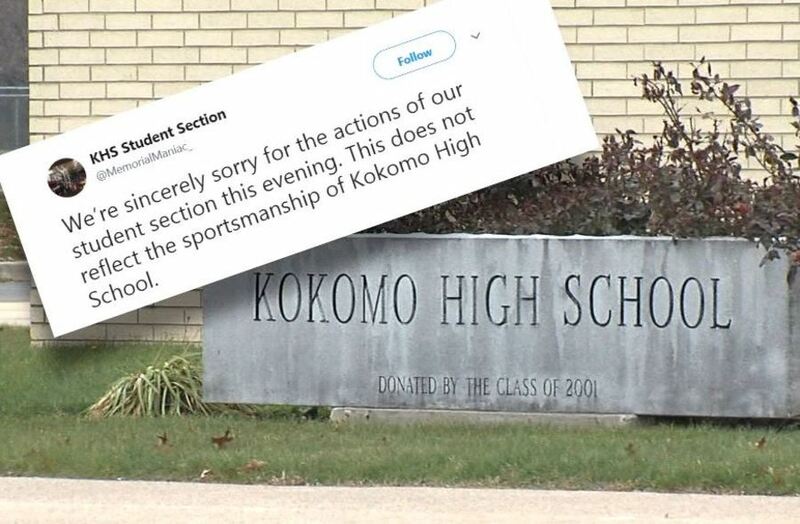 -- Kokomo High School issued an apology on social media Thursday after a group of students attending the rival game between Kokomo and Western Howard high schools displayed unsportsmanlike conduct in the stands in the form of a sign. The vulgar language was spelled out by a group of kids in the student section of the stands and it caught the attention of Steve Williams, who was a fan in the crowd and also graduated from Kokomo High School. "I was actually paying attention to the game. I glanced over and 8-9 seconds it was up," said Williams. "It didn't take long for the officials and the sheriff's to be heading over there in that direction and having that down quickly... It was handled by Western High School as quick as it came up." "We're sincerely sorry for the actions of our student section this evening. This does not reflect the sportsmanship of Kokomo High School. Memory of that sign will hopefully fade quickly, and the students who thought it was a good idea, will re-examine that thought process." Western ended up winning the game, 53-47. A student on the Western team said he believes the score was karma, for the students' sign. The students who displayed the signs were removed from the game but it is unclear if they will face any punishment for their actions.